Slam dunk, and that’s a wrap. While we were cleaning up our gear (a beer in hand) some of the guys started dunking. I quickly set up 2 snooted SB600’s on 1/2 power left & right. We didn’t get that many good shots, this is the only one that I like. 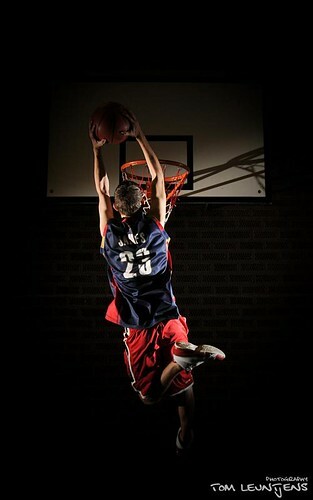 Great photo, even better elevation..
Dit is wel een echt prachtshot. Zou volgens mij nie misstaan op een grote poster.